This has been made overly controversial. I recall seeing ads that promoted Christianty and offered the Bible at the Skytrain stations around Vancouver before. If Translink allows pro-faith (hopefully of a variety of faiths) ads, they should allow anti-faith ads. Although, we may not agree with this campaign or the beliefs, Islam does accept people of other faiths. As part of that we have to be tolerant that others can, will and live a different life based on different beliefs. It is only our duty to preach the truth, and if they feel it is their duty to preach their beliefs, it is hypocritical for people of faith to allow pro-faith ads but not anti-faith ads. On that same note, we have been shocked by the comments of some aetheists, some adamant and demanding that we accept their beliefs, even while we've never personally forced anything on them. Of course people are people and you will find radicals from any group unfortunately. It's not yet clear if people in Metro Vancouver will soon get a look at a controversial ad campaign by atheists that challenges people to live without God. On Monday the group Humanist Canada claimed it had bought advertising space in SeaBus terminals for signs that will read, "You Can Be Good Without God." TransLink denied on Tuesday the ad campaign has been approved yet, or that any ad space has been sold to the group. Spokeswoman Judy Rudin said the group had not yet submitted necessary documents to show how they would pay for an ad campaign, and that no ads had yet been submitted. A similar effort by a separate group claimed to have a deal for similar ads to appear on buses in the Toronto's transit system. On Monday, the Halifax Transit Authority deemed the ads too controversial and refused to sell one group ad space. Nancy Swartz with the Secular Humanist Association in Victoria said it's running into the same problem there, and the ads have been rejected by BC Transit, which oversees transit outside the Greater Vancouver area. "I think it's kind of silly to say that they don't want any philosophical positions put on a B.C. bus. … I think it's kind of juvenile, really," said Swartz on Monday. BC Transit spokesperson Joanna Morton said the organization has a policy prohibiting religious or philosophical ads on buses and other parts of the system. "Our buses are a place of work. Our operators can't choose which bus they drive in the morning, nor can our customers choose which bus they ride, so it is in the interest of our customers and our employees that we maintain a sense of control as to which advertising gets displayed on our buses," said Morton. 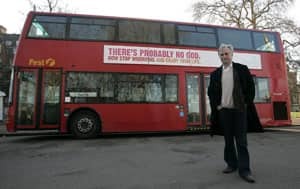 The unorthodox campaign was inspired by one that began last summer in London, England, when a woman who is an atheist bought a bus ad that read, "There's probably no God. Now stop worrying and enjoy your life." Since then, the idea has been picked up by numerous secular groups around Europe and the United States — and now Canada. Pat O'Brien the president of Humanist Canada said his group, which is devoted to separating religion and public policy, is trying to reach out to others who have doubts about a higher power. "We want people to know that belief in a god is not necessary to live a full, moral and happy life. Humanists embody this concept every day," said O'Brien in a statement published on the group's website. "We are not interested in telling people to discard their faith. We are interested in educating people about facts and the values of humanism and encouraging them make up their own minds." "In Canada in particular, I think there are a lot of secular people. That's the way they live their lives. … I think it would be nice if they knew there were other people out there that felt the same way," he told CBC News in an interview on Monday. "The 'Good Without God' transit campaign was created to reach out to atheists, agnostics, skeptics, trans-humanists and other non-believers, [and let them know] that there is an organization that protects their rights, values and promotes the separation of religion and state," he said.